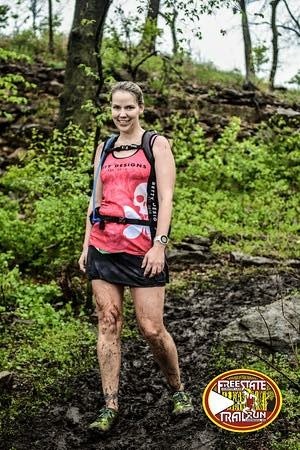 I recently received the Orange Mud Endurance Pack that I ordered and wanted to share my experience now that I have used it on both runs and rides! I ordered the orange pack, but is also comes in gray and a really cool lime green. (I almost ordered the green!) There is also an option to upgrade the pack with shock cords to hold trekking poles. I don’t know why I am staring off into the distance. The first thing I noticed was high light the pack was. It is made of a breathable mesh, so that probably helps. It weighs less than 10 oz. That said, it has a crazy amount of storage room for something so small. A family of 5 could live in these pockets. There is a bladder compartment. (The bladder holds 70 ounces.). A main cargo compartment. A zippered elastic pocket with a key clip. PLUS!!! Two storage compartments on the chest. AND!!! Shoulder pockets! Now… these front compartments are what made me fall in love. While I don’t mind putting my phone and keys in a pocket on my back, there are some things I like to have handy and not have to take off my pack and rummage around for. I like to have a small fuel snack available (ziplock of honey stingers or GU) and I like having my pepperspray easily accessible. I mentioned on my paved trail run, I was nervous about running through under-highway tunnels at 10:00 at night. It gave me some added comfort in having my pepperspray strapped to my hand. I had been carrying it in my front pocket and it was just a quick grab to have it in my hand. I also like to practice eating on the go, so having my snacks within reach means I don’t have to stop and dig for my fuel. Grab and go! The bladder was a different style than I was used to with my previous bladder packs…. But it turns out, I really like it! It was so easy to open the bag up and dump tons of ice into it. (It fits right over the ice dispenser at the gas station!! I think it would also make adding Tailwind mix easy as well. (I haven’t used Tailwind in my bag yet). The bladder is also easy to remove and clean, so I didn’t notice any funky taste or smell with my water. I also have noticed some runners have put an extra water bottle in the front pocket. That would be so handy if I wanted to have a separate bottle for Nuun or Tail Wind. I will try it and report back on that! I was able to tighten the straps under my arm pits and around my ribs to keep the pack from bouncing around. With the separate straps, my chest didn’t get smooshed or chafed. I cut the tube down a bit for running, but wanted to try a ride before I did anything too crazy. It turns out my tube was still a bit long for biking, so I ended up cutting the tube so it hit right at the bottom of the pack. All in all, I am really happy with my Endurance Pack and will continue to use it on my long runs and rides. Shorter runs, I am still happy with a handheld… but man, is it nice having the extra pockets for my phone and keys! Because I love the pack so much, I wanted everyone to be able to get one! I asked Orange Mud what they could do for my friends, and they gave me a code for 10% off, Plus a free water bottle with purchase!! The code is good for the next 2 weeks so get a move on! EP-SARAH will get you hooked up here!. Who else loves Orange Mud?? I would love to hear what OM gear you have and how you are liking it! Cool weather still requires hydration! This summer was really hot and humid, which made it really easy to remember to bring your hydration along. I made the mistake of thinking I didn’t need water for a 6 mile training run, and halfway through I realized that was a bad decision. 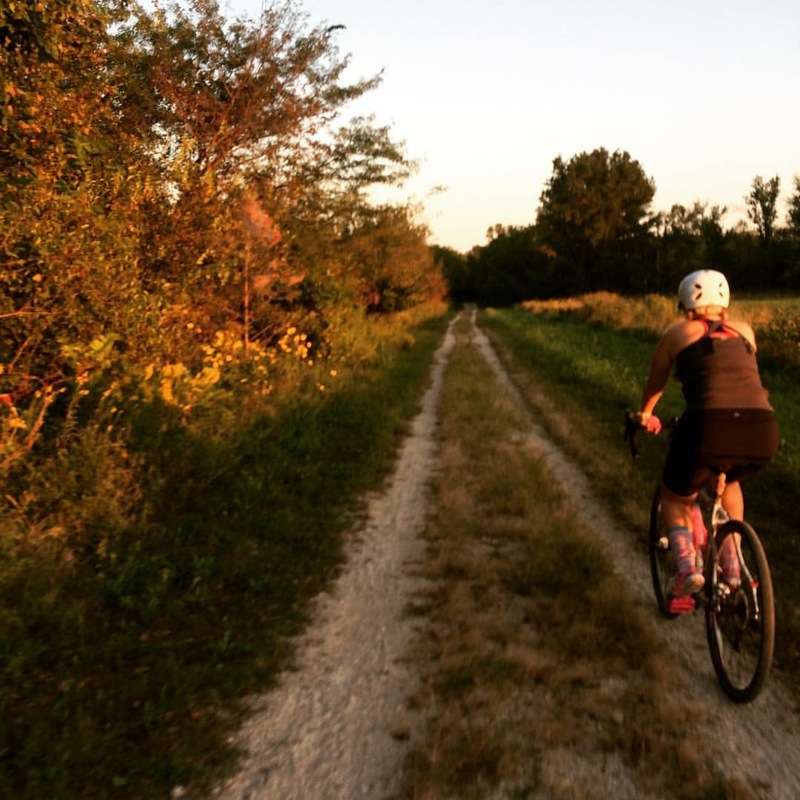 Flint Hills long rides mean bring hydration and nutrition – there are no convenience stores! For my bike, I have 2 water bottle cages. If I am doing a really long ride, I might also grab my hydration vest as well. (It is nice to be able to get a drink without having to reach down and fumble for bottles). I did have an aero bottle that was attached to the aero bars on my tri-bike, but I didn’t really like it. I did learn to adjust my vest up higher on my shoulders after this picture was taken! No more chafe issues! For running, I have various handhelds and vests. My favorite is the Orange Mud vest with 2 water bottles. I like being able to have my bottles refilled more easily than a vest, and I like all the little compartments for my cell phone, keys, Honey Stingers.. and my highly important ziplock bag of baby wipes. 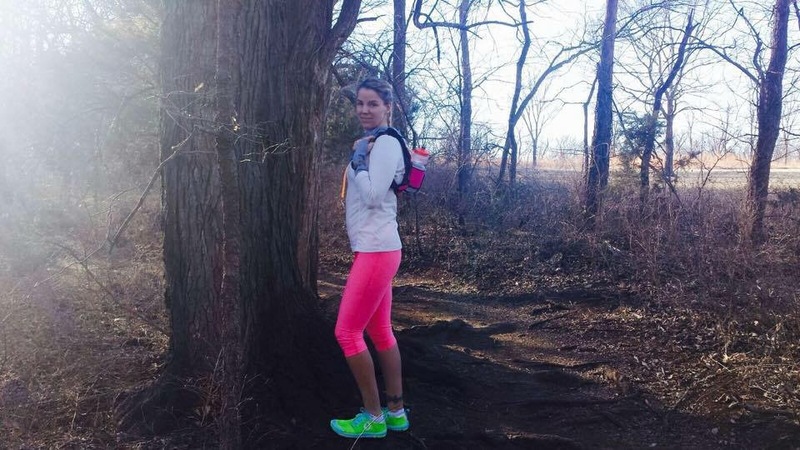 I took my handheld for Flint Hills Marathon since my Camelbak made me chafe at the marathon before. For hydration, I know a lot of people like drinks like Gatorade, but even watered down, it tastes too sweet to me. I always pick water at aid stations. (For short races, like 5 or 10K, I don’t bring a handheld and just rely on the aid stations.) For half marathons, I like to bring a small handheld. For marathon and longer, I use my vest. Free State Mud.. .errr. Trail Marathon. Since I have two cages on my bike, and 2 bottles in my vest, that lets me bring a couple options. I like to do one bottle of water and one of Nuun. I started drinking Nuun for training and racing a few years ago. 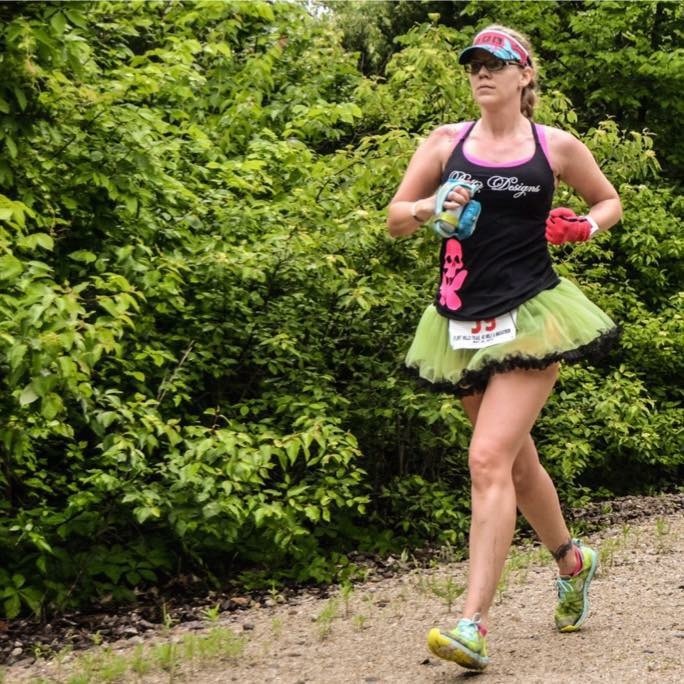 (I have gotten many a friend hooked on Nuun by bringing tubes to relay races). My very favorite flavor is watermelon (which recently became available year-round), but I also love strawberry lemonade. That said… If you have not already tried Nuun, now is your chance! And if you already love Nuun, you can add to your stockpile. 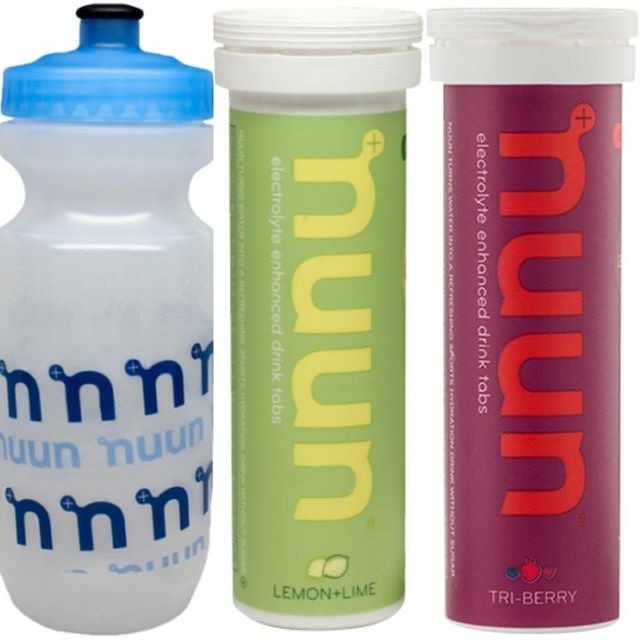 Nuun will be giving one lucky reader a Nuun water bottle and a tube of both Lemon Line and Tri Betty, as pictured below. This sweepstakes is open to those over 18 and residents of United States. I will announce the random winner on 11/13/15. The number of eligible entries received determines the odds of winning. Void where prohibited by law. Product provided by Nuun Hydration. All thoughts and opinions are my own. You may notice there are some changes to the blog! First, I have been including posts on running and triathlons. These are marked by the category “run + bike + swim,” so if you are not into ready those, you can easily pass those over. Home posts are still go! I am working on a update to the Boys’ bathroom – and it…. Is…. AWESOME! So please stay tuned for that. I am totally not selling anything and clicking the Nuun link only takes you to their website. (There are no cookies or tracking or commission or anything). Just trying to share the love. Nuun Hydration are little electrolyte drinks tablets you pop into water. I became a big fan of them and like that I can just toss one in my water bottle and not have to rely on sugary sports drinks at aid stations. (I also like to sip on them at work instead of soda). So far my favorites are strawberry lemonade and lemonade… but I just scored a box of watermelon and really like those, too! So again… not trying to sell you anything at all. I promise!